Some species of reptile do not take well to being handled such as the Green Anole and Green Iguana. Species such as Royal Pythons and Chameleons are rather shy and may become stressed quickly whilst being handled so handling sessions should be relatively short. Over-handling in any species is stressful so be aware if you’re reptile appears to be uncomfortable while being handled so not cause it too much stress. Personality differences are also found amongst individual reptiles which can influence how well they take to being handled. Avoid restraining the animal if possible. Restraining may cause the animal to thrash violently in an attempt to escape, which could result in injury to both keeper and animal. Restraint is also extremely stressful which could impact the overall health of the reptile. It is best to attempt to gain your pets trust. You may do this by holding your hand in the reptiles enclosure for several minutes a day allowing them to get used to your presence and letting the reptile come to you willingly. Always move very slowly around nervous animals as rapid movements and sudden changes in hand direction will be perceived as a predator attack. When picking up a reptile, try and approach them from the side rather than directly above or behind as once again this may be perceived as a predator attack such as from a bird of prey. To pick up, slowly and gently begin to cup your fingers around the midsection of the reptile. Nervous snakes generally dislike their neck area being touched but if approached gently enough will allow you to lift them from lower down their body. Many lizards are able to drop their tails if they feel threatened, for this reason you should avoid grabbing a lizard by its tail. Young and nervous snakes may adopt a striking position as you move your hand closer to it - if this happens simply stop moving, the snake should not strike if you are no longer moving your hand towards it. Once the snake relaxes out of its defensive pose and turns away you may begin to move towards the snake again, gently grab it around its stomach and lift. Allow the snake to slither from one hand to the other, at first it may be rather quick but will soon settle as it realises that you mean it no harm. After several short handling sessions over several days the snake will eventually tame. Larger and older snakes will need to be supported with two hands, if a snake feels unsupported it may panic and begin to thrash. The same is true for lizards. Do consider that despite repeated handling sessions their are some individuals which will never tame. If an otherwise tame reptile squirms, hisses or vocalises while being handled, either the reptile does not feel secure with the way you are holding it or may be in some discomfort with the way you are holding it. 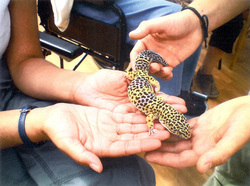 Reptiles preparing to shed are also less compliant with being handled. Other behaviours that indicate a reptile feels uncomfortable with being handled include snakes that tightly wrap around the handler, snakes retracting their heads into an S-curve with head low down and lizards attempting to scramble up the handlers clothing. If a reptile does begin to struggle whilst being handled, do not grip it still. Allow the reptile to regain a more comfortable position on your hand. Tortoises and turtles which appear to be ‘swimming’ in the air are indicating that they are stressed, these animals need something under their feet, even finger tips or a palm will do if possible. Confidence while picking up and handling a reptile will make the reptile feel more comfortable and relaxed. Nervousness can be communicated to the reptile by moving tentatively, this can frighten the reptile and make the reptile nervous too. Reptiles are also able to recognise their owners from smell, sight and even voice. They may react more positively towards the owner and are able to recognise individuals which they’ve had a negative experience with. If you are nervous while handling a reptile do not squeal or scream as reptiles are very capable or hearing, even snakes are able to hear air-borne sounds, this will only frighten the animal. Allow them to get comfortable with you and also be aware that other pets which may be present in the room with you may also frighten the reptile as unfamiliar creatures, smells and sounds will all be quite alarming. If a reptile bites while being handled do not pull away rapidly. Sharply pulling away may damage the animals’ teeth and allow infection to set in. Bites from juvenile reptiles typically aren’t painful and in most cases are hardly detectable. If you are bitten remain calm. Usually a fearful reptile will strike out quickly and retract but if a reptile does decide to cling on, very carefully lift the jaw open and ease the reptile off. Alternatively you may wait until the reptile willingly lets go. Also make sure to wash your hands before and after each handling session to prevent the spread of any possible diseases to and from the reptile.